See more Stuart Weitzman Wedge sandals. We check over 450 stores daily and we last saw this product for $179 at Bergdorf Goodman. 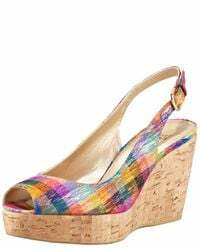 This Stuart Weitzman wedge sandal is sure to brighten your look and your day with its colorful tinsel pattern and naturally lightweight cork wedge. Tinsel-print silk. Peep-toe rests on platform. Adjustable slingback. 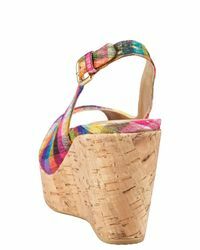 2 3/4" cork wedge heel. Rubber sole. Imported.